Strategies to keep your horse’s GI tract functioning smoothly. Maybe you don’t think much about your horse’s digestive health. Or maybe he’s had a bout of ulcers or colic, and you think about it a lot. In either case, the equine digestive tract is an amazing place. The horse’s stomach and small intestine are not so different from ours. The stomach acid and enzymes break food down, and the small intestine absorbs simple carbohydrates, proteins, fats, vitamins and minerals. Things get more complicated as undigested food moves to the hindgut (cecum and large intestine). The hindgut is where microbes break down plant fiber that is indigestible to mammals. Unlike meat-eaters, herbivores such as horses depend on many billions of microbes (bacteria, protozoa and fungi) in their hindgut to provide much of their energy. Plant structural material that would be indigestible to humans provides 30 to 70 percent of the horse’s energy, depending on his diet. The tiny helpers that process fiber into fuel are an extremely important factor in digestive health. As you might imagine, this creates a delicate balance between what you feed and the particular specialist microbes that feed on it. With lots of digestive and gut health supplements coming onto the market, could you be doing more to feed your horse (and his microbes) better? Let’s find out. Unlike the human stomach, the horse’s stomach lining is made up of two portions: glandular and non-glandular. The lower, glandular half has a protective coating and is where hydrochloric acid and enzymes are secreted. The top portion has no such protective coating. Since horses in the wild generally have small amounts of fibrous feed coming in 18 to 20 hours per day, this keeps the stomach fairly full and absorbs the acid. Horse stomachs empty out quickly, within about 15 minutes, if food doesn’t keep coming in. Most domesticated horses are not fed constantly, leaving them with an empty stomach. 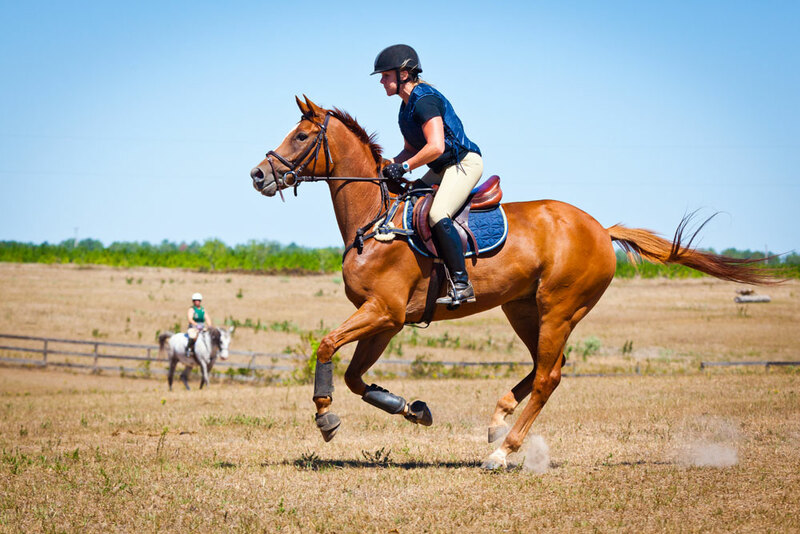 Exercising on an empty stomach allows the acid to slosh around and come into to contact with the unprotected portion of the stomach, one of the big reasons such a high number of performance horses—60 percent or more—have gastric ulcers. Stress, such as travel and incompatible herd mates, can also lead to ulcers in a short amount of time. So what is a horse owner to do? Exercise and confinement to a smaller space are part of modern life for our beloved domesticated equines. Twenty-four-hour pasture grazing is the best way to prevent ulcers, although not all situations have enough land for this. Performance horses, in addition to their frequent travel schedules, are often kept in stalls most or part of the time. To head gastric ulcers off at the pass, feed frequent, small meals throughout the day. A minimum of three feedings per day is best. 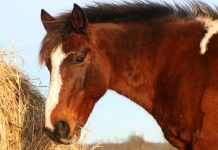 If keeping a horse in a stall with hay, the best option is to put it in a small-hole net to slow down eating and make the hay last longer, allowing the horse to pick at it as if he were grazing. If your horse tolerates alfalfa hay and it’s available in your area, this is a useful forage for ulcer prevention. It’s thought that the high calcium content in alfalfa buffers the stomach, much like taking an antacid. However, the high calorie content means that it should not be fed free-choice, but rather in small feedings to complement larger amounts of grass hay. Minimize stress as much as possible by keeping your horse with agreeable neighbors, limiting time on the trailer and away from home, and feeding at the same scheduled times every day. Also avoid excessive use of non-steroidal anti-inflammatories (NSAIDs), which can have adverse affects on the stomach lining. Since treating ulcers can get pricey, most horse owners would prefer to avoid them in the first place. There are many supplements available for gastric support. 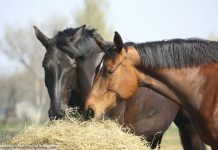 According to the supplement pros at SmartPak.com, ingredients like sea buckthorn, glutamine, aloe vera, pectin, and lecithin have been shown to be especially helpful in supporting overall stomach health. Gastric supplements can also include antacids to soothe the stomach, licorice to help restore healthy stomach tissue, L-Glutamine to help promote healing, soluble fiber to help form a protective layer over erosions, and plant adaptogens, which may help horses better manage ulcer-causing stress. Keeping the microbes in the hindgut healthy is a huge priority. This fermentation vat holds a whopping 30 gallons or so in volume. The beneficial bugs it contains regulate pH levels, helping keep the “bad bugs” (pathogenic bacteria) away. The good guys can also produce substances that kill harmful bacteria or neutralize toxic substances produced by them. When everything is functioning normally, good bugs produce volatile fatty acids used by the horse as an energy source, B vitamins, vitamin K, and certain amino acids. To avoid throwing this happy little ecosystem out of whack, it’s best not to suddenly change your horse’s diet. 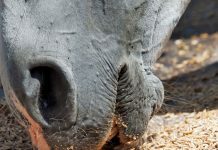 Since different microbes specialize in different types of feed breakdown, suddenly changing hay or grain types and amounts may cause a big die-off, resulting in digestive upset or colic. If you feed a grain-based concentrate, it’s critical to limit the amount fed in each meal. If a horse has more than 0.5 percent of his body weight at a time (a 5-pound meal for a 1,000-pound horse), the starches cannot be completely absorbed within the small intestine. This “overflow” reaches the hindgut and creates big problems: The starch is fermented into lactic acid, lowering the pH of the hindgut. This acidic environment kills good bacteria and leads to the release of toxic byproducts. 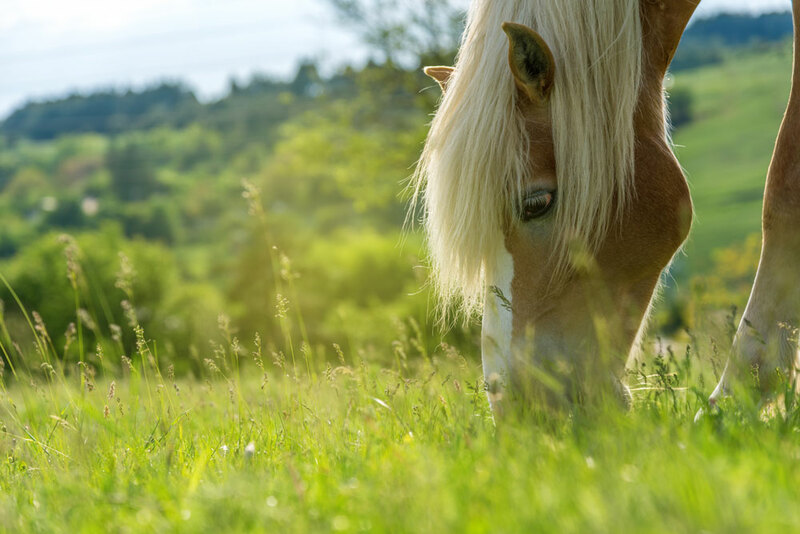 Although it’s not known exactly how it happens, these toxins can set off a chain reaction that leads to laminitis. The extreme example is a pony getting into the grain bin and gorging himself, resulting in acute laminitis. To keep the hindgut as happy as possible, always make changes to any feed type slowly, over the course of one to two weeks, gradually increasing the amount of the new feed. This allows the microbe population to adapt gradually and without incident. Always feed good-quality hay and grain; with hay in particular, carefully check for mold and weeds. If your horse has been treated with antibiotics or is regularly stressed, consider a hindgut supplement. Hindgut supplements can include prebiotics, probiotics, yeast and enzymes. Most supplements for hindgut health focus on keeping microbes healthy. Times of stress or changing diet can upset the apple cart, and these are designed to keep everything chugging along as it should. Probiotics: Probiotics are live beneficial bacteria (Lactobacillus acidophilus, Bifidobacteria, et cetera) thought to help establish populations of the right type of microbes in the hindgut. Prebiotics: Prebiotics are non-living substances fed in order to nourish good microbes and help them flourish. These most often include oligosaccharides and beta-glucans from yeast cell walls or oats. They also bind E. coli, Salmonella, and other pathogens to remove them from the system. Yeast: Yeast is a single-celled fungus. Studies with horses have shown some promise that live yeast (Saccharomyces cerevisiae and Saccharomyces boulardii) supplementation increases fiber digestion and nutrient absorption in the hindgut. Yeast can be fed either live for probiotic use or killed (aka prebiotic) in the form of brewer’s yeast, a byproduct of the beer industry. Brewer’s yeast is high in complete protein and B vitamins, and has been found to increase feed palatability. Anecdotally, yeast is reported to improve weight, coat and performance when fed to horses. Enzymes: Unlike prebiotics and probiotics, enzymes work by directly breaking down feed components. Senior horses having trouble maintaining their weight and horses prone to digestive upset may benefit from supplementation with digestive enzymes if your vet rules out other causes. A few types include trypsin (breaks down protein); lipase (breaks down fat); amylase (breaks down starch); lactase (breaks down sugar); and cellulase (breaks down fiber). Protein and cellulose are the most useful components to target; fat, for example, is nearly 100 percent digested in horses. Whether you plan to manage your horse’s digestive health through diet alone or with the help of supplements, always make sure to provide an unlimited source of clean water. 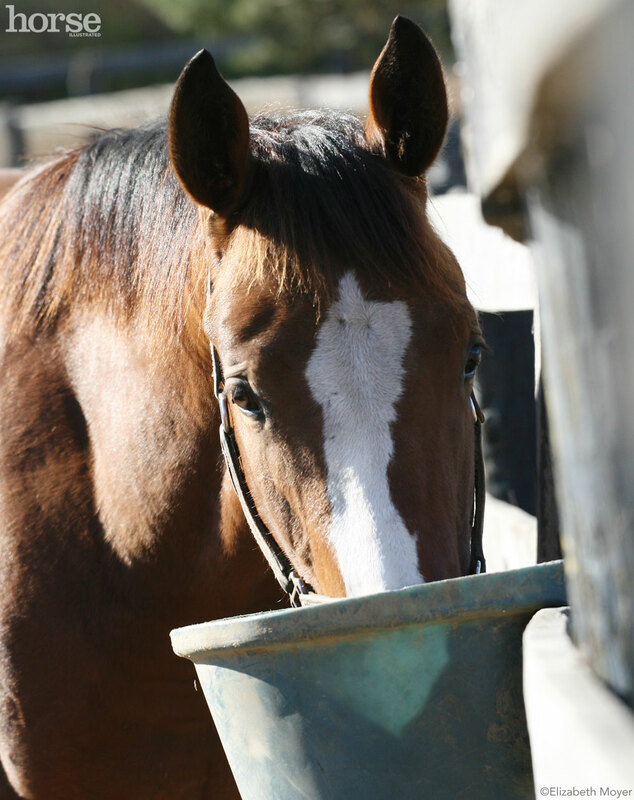 Even a short amount of time with dirty or empty buckets, or water that is too hot or frozen to drink, may be enough to dry out digestive contents and cause impaction colic. Bottom line—keep your horse and his tiny gut helpers happy, and you will have fewer equine health concerns to worry about. Managing Editor HOLLY CACCAMISE has an M.S. in Animal Science with a specialization in equine nutrition.